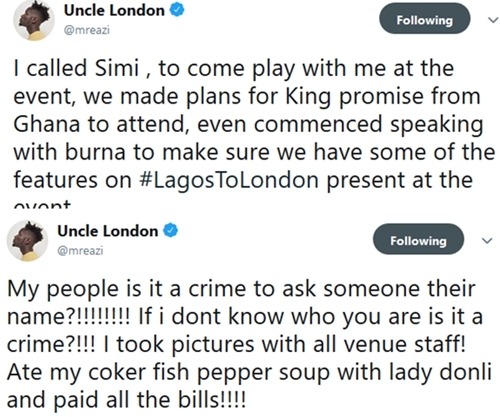 WHY Mr. Eazi was kicked out from The Music Concert after asking the owner, WHO BE YOU ? Okay first if you haven’t listened to mreazi’s latest album, I encourage you to listen to it. It has many hit songs that are currently being enjoyed around the globe. Lagos to London. Oluwatosin Oluwole Ajibade, the Nigerian singer who is popularly known by his stage name Mr Eazi, was reportedly thrown out and banned from art centre, TerraKulture, in Lagos yesterday, November 23rd after he acted rude to the owner of the place. It was gathered that Mr Eazi and the owner of the place, Bolanle Austen-Peters had a one on one and Mr Eazi disrespected her obviously not knowing who she was. That disrespect earned him a permanent ban from the establishment. The Ghanaian-Nigerian singer had booked TerraKulture for his show billed for yesterday which has since been cancelled. 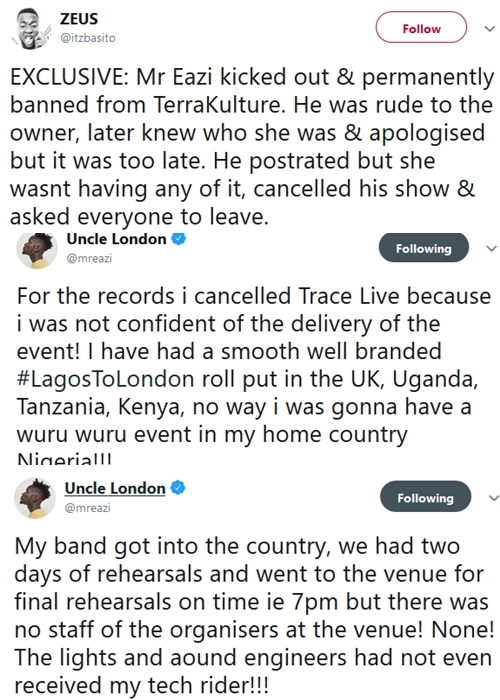 In a series of tweets, Eazi said he got to the event centre and did not like the stage he saw there which was different from what he had asked for. The idea behind the project, which he again refuses to call an album is to detail his journey from the busy streets of Lagos to the cold corners of London a place where he now calls home and the album is littered with a number of interesting guest collaborations across the two divides in fast-rising talent, Lady Donli, Burna Boy, 2baba, Simi, Maleek Berry and Ghana’s King Promise while the international cast includes the likes of Giggs, Sneakbo, Chronixx and Lotto Boyz. The mixtape can best be described as a project of two halves with the first set of songs covering for the Lagos audience while he dedicates the final joints to his London crowd. 5 Major Christmas Events in Accra You Should Attend.